So as Linda was pulling together all the pieces of paper necessary to file our U.S. tax returns (because Uncle Sam does indeed tax all worldwide income, unless you're in a special exempt group), she decided to add up the receipts for just about everything we spend money on regularly in Argentina. The spreadsheet to the right basically lays out the details. All amounts are in Argentina pesos, which has been trading for some time now at around 3.95 pesos to the U.S. dollar (down from 3.78 a year ago). Basic living expenses are low. Utilities, especially electricity costs, are subsidized by the government. Without the subsidy, our electric bills for the year would have totaled slightly over 1,000 pesos (still low by U.S. standards). Water is not metered, so consumption is estimated. Property taxes, called "rentas," are collected by the city government and used to pay for street lighting and cleaning and maintenance of public roadways and sidewalks. The taxes on our 88 square meter apartment have not increased since we bought it in 2006. For us, then, the taxes actually have gone down, since the dollars we transfer here have increased in value against the peso. Our laundry expenses appear high because we do not own a washing machine or dryer. Our 88 square meters don't offer enough space. On the upside, for every 7 "valet" services (one bag full washed, dried, and folded for 15 pesos), we get one free from our favorite laundry. We've obviously failed to add in expenditures for such things as clothes, entertainment, transportation, and travel. Suffice it to say that public transportation - subways, buses, and domestic airlines - are also subsidized. Bus and subway tickets run about 1.10 pesos per ride for everyone. And thanks to our residency status, domestic tickets on LAN Argentina and Aerolineas Argentina are about half what they cost nonresidents. 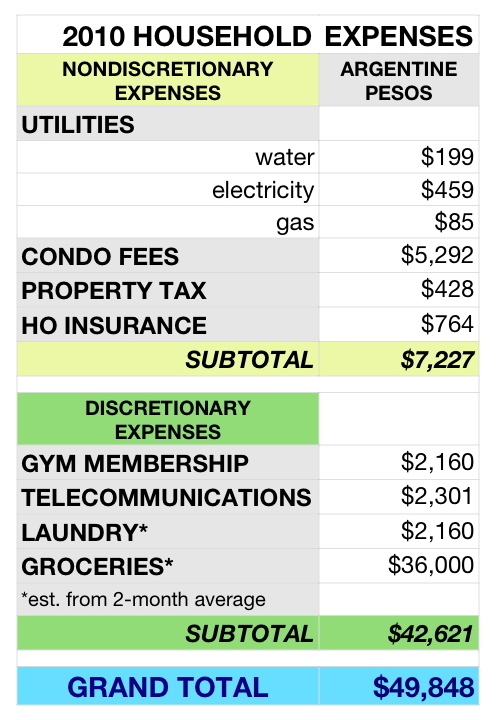 Additionally, our living costs also are low since we own our apartment outright. Mortgages are uncommon here; interest rates for those few in existence hover around 22% (meaning real estate bubbles do NOT happen in Argentina). But rents are low, and very nice apartments can be found for under 3,000 pesos per month. All in all, a couple can live well here on an income not much beyond the poverty threshold in the U.S. Put another way: our "grand total" for 2010 is well below what we paid in property taxes alone in Austin in 2005.